A delightful treat for any fruit lover, this carefully packaged fresh fruit collection arrives fresh to your door from the orchards of the Fruit Tree™. SUPREME - A gift from The Fruit Tree™ is a gift from the lush, fertile orchards of California and Oregon. Our fresh fruit assortment includes 5 crunchy Braeburn apples, 4 juicy Comice pears and 5 ripe-from-the-tree navel oranges. DELUXE - Bright reds, oranges and greens burst from this in-season fruit assortment from The Fruit Tree™. Enjoy the juicy flavor of 4 navel oranges, complemented with 4 spicy-sweet Braeburn apples. Mix together with 3 divinely ripe kiwis and the receiver will enjoy a delicious fruit medley. Arrives delicately packed with ripe-from-the-tree flavor. 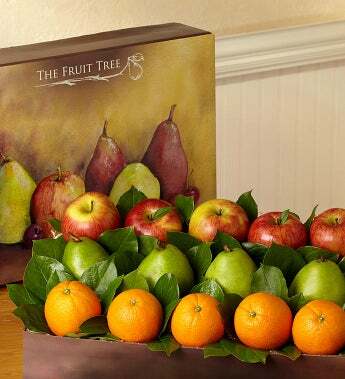 GRAND - A delightful treat for any fruit lover, this carefully packaged fresh fruit collection is full of 2 ripe-from-the-tree navel oranges,3 Fuji Apples, and 3 D'anjou Pears carefully chosen from the orchards of The Fruit Tree™. Each fruit is distinct in flavor, handpicked and handpacked with loving care.